We arrived in Mysore on Wednesday afternoon and settled into the Hotel Palace Plaza near the Mysore Palace. Rita shopped at the Handicraft Emporium while I visited a barbershop and then walked around town. On the next morning (Thursday Thanksgiving), we took a local bus to the top of Chamundi Hill to visit the Sri Chamundeswari Temple, the Godly Museum, and to enjoy the view from the hill. Rita returned to town for more shopping while I walked down, then back up, the 1100 or so stairs to the bottom of the hill, visiting the carved stone statue of Nandi, Shiva's bull, on the way. The rest of the day was spent on report writing and Internet cafe visiting for me, window shopping and resting for Rita. On Friday morning, we boarded a tour bus headed for Ooty. The tour was to be a round trip from and to Mysore, but we took all of our baggage with the plan of leaving the tour in Ooty. We were picked up at 7:30AM, and then driven from hotel to hotel as the tour picked up other customers. Many of them were not ready, so the bus returned to some hotels a second and third time. In one case, we returned a third time and then waited an additional twenty minutes for the family to get ready, with a good deal of grumbling from some of the on-time passengers. We finally left the city after 9AM. We had a similar experience with the Goa beach tourat least an hour on the bus running here and there before the actual tour started. I guess this may be the norm, to be treated as an opportunity to see more of the city. Anyway, the bus headed south on some pretty rough roads. At one point, for some distance, the pavement consisted of a one-lane ribbon of battered concrete with pot-holed asphalt shoulders. Buses and trucks zipped down the center of the road toward oncoming vehicles, moving aside at the last minute to pass oncoming traffic. We drove through Mudumalai Wildlife Sanctuary but stuck to the main road (as all vehicles except special park vans were required to do), and I'm sure that the tigers, panthers, and other exotic animals stay well away from the traffic. We did see some monkeys and some chital (spotted deer) who waited to be fed near the side of the road. As we approached Udhagamandalam (known as Ooty), we began to climb through a series of switchbacks on the side of the mountains known as the Niligiri Hills. The road was often very narrow, and at one point we maneuvered past a truck with less than an inch to spare. We passed what looked like an outing of the Enfield Motorcycle Club stopped beside the road, but they soon overtook us, passing us in ones and twos. We reached the town of Ooty, 2200m in elevation, at around 1PM and were dropped off at the Nilgiri Woodlands Hotel. 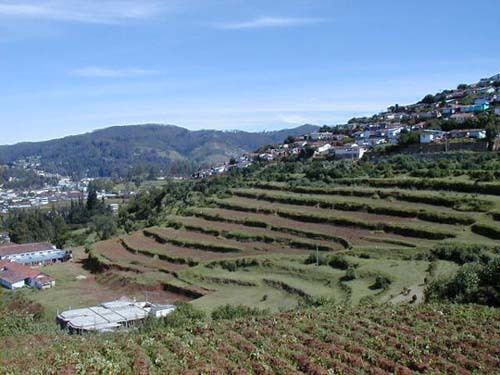 Ooty has some of the most beautiful scenery I have seen in Indiabright green terraced hillsides planted in various crops, including a lot of tea. My experience has been that landscape pictures never do justice to the real thing, but I have taken and included a few anyway. Soon after we arrived, I walked down to the train station to check on our train to Mettupalayam and learned that a recent landslide had blocked the tracks, and the train was only running as far as Coonoor. We found our room to be cold and the bed uncomfortable. The double bed was made up with single-size linen and blankets, so there were two bottom sheets with a gap in the middle, and one top sheet that went down only to our knees. The blankets overlapped in the middle, but parted company once we got in. Rita was not feeling well and, after a cold night, was ready to leave Ooty immediately. But when she saw that it was a nice, warm day, she agreed to stay until mid-afternoon. The plan was to take the bus to Coimbatore, where we would try to move forward our train reservation to Cochi and head there sometime Sunday. I walked up into the hills behind our hotel and found some tremendous views, so after lunch we hired an autorickshaw to take Rita and me up the hill to Bishops Down so that Rita could also share the view. The autorickshaw turned out to be on its last legs and overheated repeatedly on the way up, which was OK because I wanted to stop and let Rita admire the view from the many lookout points along the way. We hired a different autorickshaw to take us and our luggage to the bus station. The plan was to take the bus to Coimbatore, where we would try to move forward our train reservation to Cochi and head there sometime Sunday. The road down from Ooty has many switchbacks and tremendous views. Part way down, we passed a tourist bus that had become stuck on a hairpin turn when the back of the bus hit the pavement. Our bus driver was able to get by, despite the tight quarters. The road paralleled the train tracks for part of the way, so we got some idea of what we were missing by not riding the toy train. We arrived at Coimbatore about dark and took a room at the Park Inn Hotel near the train station. Early on Sunday morning, I tried to change our tickets and learned that it was too late to make reservations for either of the trains leaving during the day. We decided to stick with our reserved 12:45AM departure rather than try standby on the earlier trains. There was nothing we were dying to see in Coimbatore, so we spent the day working on this and other reports, and watching Florida election coverage on CNN. Our check-out time was 6:45PM (most Indian hotels have 24-hour checkoutthe room is yours for 24 hours from the time you arrived; after that, you owe another day's rent), so we spent the evening at an Internet cafe, at a restaurant, and finally at the train station fighting off the mosquitoes. By 1AM, we were asleep in our bunks and on the way to Cochin. The next report will be from the state of Kerala, Rita's birthplace. during our drive through on the way to Ooty. advertising posters off the wall in Ooty. an autorickshaw that is on its last legs. magnificent Ooty scenery in the background.